South African mayor defends herself after her “scholarship for virgins” causes international backlash. A South African mayor is defending herself after her “scholarship for virgins” caused an international backlash. Mayor Dudu Mazibuko of uThukela municipality, one of eleven districts in the KwaZulu-Natal province, has been thrust into the spotlight for the controversial scholarship. 16 young women have so far received the “Maiden's Bursary Award.” Recipients of the scholarship become eligible upon producing a certificate of virginity. The certificate is attained through controversial virgin testing which is conducted by a female elder in the community and typically performed on a grass mat. Following holiday breaks, the young women must undergo a retest and present newly signed documents indicating continued virginity or have their scholarship revoked. An online petition has garnered over eight hundred signatures. “Student groups across the country have been calling out for free, quality education for all. Yet right now, women are being forced to give up control of their bodies to access higher education,” the petition reads. “Virginity testing is an invasive, flawed, traumatising and sexist practice, that has no bearing on whether or not women should be granted bursaries." The petiton is referring to the #FeesMustFall student protests that rocked South Africa this past October in response to a propose 10.5 percent. The movement quickly spread to other universities throughout the nation with students calling for not only a rollback of the fee increases but for an end to what many perceived to be the continuation of white supremacy within the country's institutions. Twitter has also lit up with bewilderment at the scholarship. society seeks to control the sexuality of girls. hence virginity testing was created so girls can remain "pure" for their husbands. Ya'll have African solutions for women' virginity but none for Zuma's bad leadership. Tsek! The South African Human Rights Commission has begun an investigation into complaints about the scholarships. Thubelihle, a young student from a rural area in KwaZulu-Natal, will attend university in Pretoria using the funds awarded to her from the scholarship, an opportunity that otherwise would be unaffordable to her family. 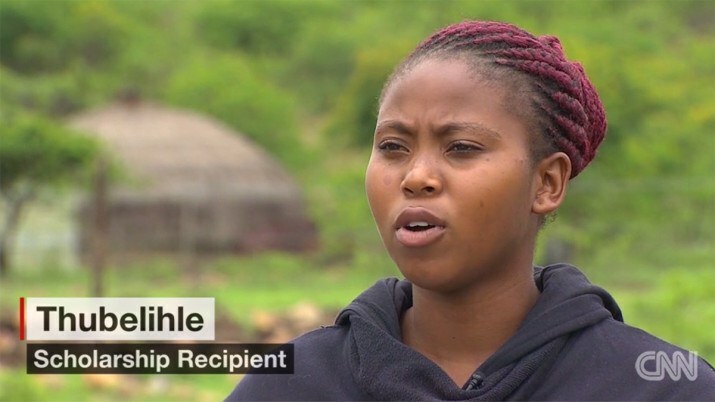 "We are keeping away from boys because we want to achieve our goals," Thubelihle said in an interview with CNN. Advocates of the scholarship view the awards as a positive influence on the young women’s lives and have cited high rates of teenage pregnancy and HIV/AIDS. Mayor Mazibuko’s office has said approximately half of pregnant mothers in the district contract the disease. Some activists are outraged by what they feel amounts to the policing of women’s bodies. Many believe the scholarship is sexist in nature and puts the onus on the spread of HIV/AIDS and teenage pregnancy on young women while ignoring the highly prevalent role of sexual violence perpetrated by men. “Virginity testing is just one symptom of the policing of how women dress, how they behave," Tanya Charles of the South African advocacy group Sonke Gender Justice said to Thomson Reuters Foundation. A similar uproar occurred in 2014 when KwaZulu-Natal’s health department planned to inject 12 female students who were headed to study in India on a scholarship with contraceptives.